Many investors have been following the yield curve all year. For the first time in this cycle, it appears the stock market recognized the flattening curve. Personally, I find it interesting how indicators evolve. When everyone follows an indicator, its results change. This doesn’t necessarily mean the stock market won’t fall after the curve fully inverts. It might fall before the yield curve fully inverts. There is a recency bias which makes investors think the next recession will be as bad as the last one. If you think the stock market will decline over 50% from peak to trough sometime in the next 1-2 years, it makes sense to sell now. There is no reason to worry about obtaining the last bit of upside in the bull market. Of course, the stock market won’t necessarily fall over 50% during the next recession. The consumer isn’t overly leveraged and there isn’t a housing bubble outside of a few cities. There isn’t overvaluation unless the corporate tax rate is raised. Stocks Decline - Investor sentiment has shifted so much since Monday. The belief that there will be a recession in 2020 went from being bearish to bullish. It was bearish on Monday because no one foresaw a recession. It’s bullish now because investors are acting like there will be a recession in 2019. CNN fear and greed index fell from 32 to 20 which indicates extreme fear. The index only exited the extreme fear category for one day. With the economy slowing, I look at fear as a bearish reading and only single digits as a signal stocks may increase in the near term. Stocks were crushed on Tuesday as the S&P 500 fell 3.24%, the Nasdaq fell 3.8%, and the Russell 2000 fell 4.4%. Russell 2000 was down the most in one day since November 2011. VIX increased 26.16% to 20.74. VIX approached a normal level on Monday before spiking again. S&P 500 has fallen 3% in one day in December in 1987, 2000, and 2008. 2018 has now been added to the list. That’s probably a coincidence. It’s unlikely there will be a crash this year like in those years as the year has about 3 weeks left. As you can see from the chart above, there have been 5 days this year where the S&P 500 has been down 3% or more. That’s almost as many 1% down days in 2017 (there were 8). From 2012 to 2017 there were only 4 days where stocks fell at least 3%. 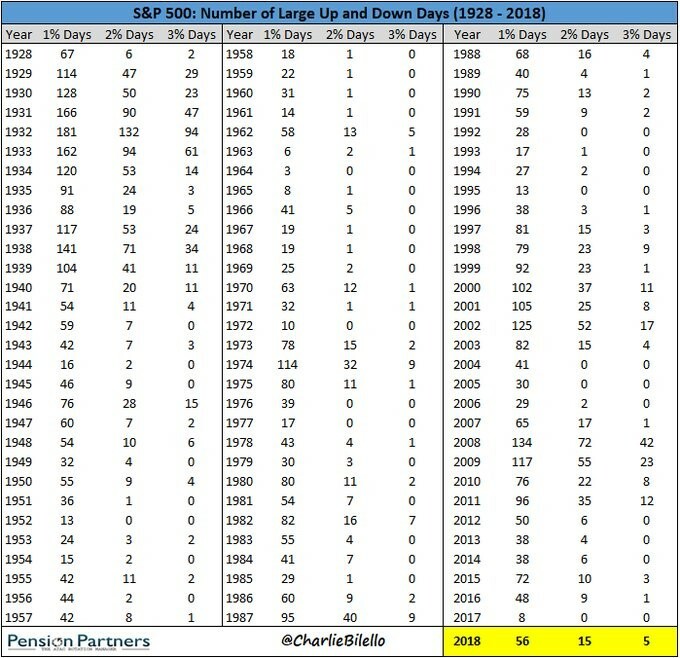 That being said, 2018 has been far from 2008 as there were 42 days were the S&P 500 fell at least 3% in 2008. Unlike, 2008 the stock market is still positive this year as it is up 0.99%. It’s doing much worse than my initial expectation at the start of the year for a 5% to 10% increase. The S&P 500 had such weak breadth that there were only 30 positive stocks in the index. Every single sector except the utilities was down. Utilities increased 0.15%. Second best sector was real estate which fell 1.26%. Both outperformed because interest rates fell. Utilities are also stocks traders flee to in times of chaos. They are the best ‘risk off’ trade. Financials and industrials were the worst sectors as they fell 4.4% and 4.35%. The financials were hurt by the flattening curve. Small banks were destroyed as the KRE regional bank index fell 5.48%. Homebuilder index was also destroyed as the ITB index fell 4.75%. It is at $31.25 which is still above the recent low of $29.65 on October 24th. Toll Brothers was the most interesting stock on the day because it crashed when it opened, but then rallied to the positive side. It closed down 1.61% at $32.99. The low on the day was $30.25 and the high was $34.26. This rally from the low to the high was 13.26%. That stock probably rallied because the weakness it reported was already priced in. However, I still think homebuilder stocks will fall if their weak results continue. Specifically, Toll Brothers reported orders by number of homes fell 13%. By dollar volume, they fell 15%. CEO Doug Yearley stated the market “softened further” in November. He compared the current market to late 2013. I think this situation will prove to be worse because it might end in recession. As I mentioned earlier, the stock market panicked as the 10 year yield fell which flattened the yield curve. Tuesday had the biggest one day flattening in 6 months. Usually, a yield curve inversion implies a recession is coming in a little over one year. Investors jumped the gun by selling stocks before the 10 year yield was less than the 2 year yield. As you can see from the chart below, the 5 year yield now is lower than the 2 year yield. That’s the first part of the inversion. I follow the 10 year 2 year yield differential closer. The 10 year yield is now 2.91% and the 2 year yield is 2.79%. I think the December rate hike could be the last hike of this cycle. 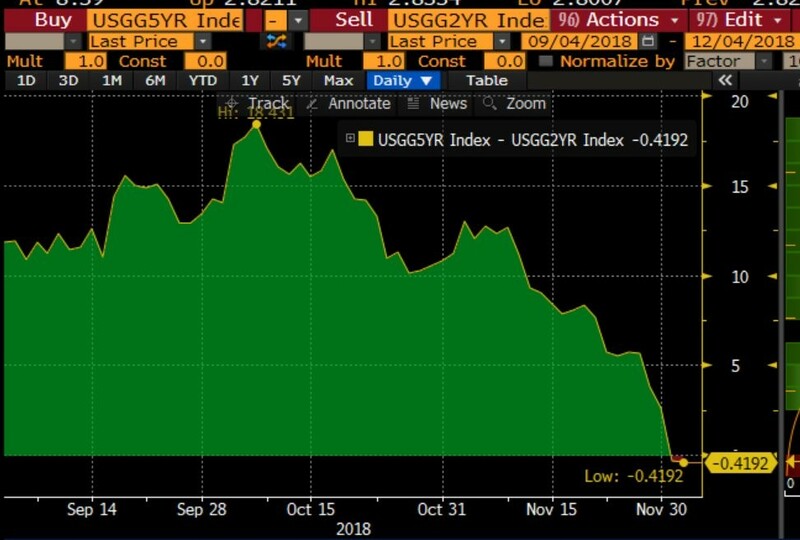 This means I believe the 10 year yield falling has a better chance of causing an inversion than the 2 year yield rising does. With the 2 year yield falling, there is now a 78.4% chance of a rate hike on December 19th. I have put out the possibility that if the stock market falls below the recent lows, the Fed won’t hike rates. The situation is very interesting now because the meeting is so close. Since the Fed has guided for a rate hike in December for the past few months, it would be very difficult to back out now. The recent low in the S&P 500 is 2,632.56; the stock market closed Tuesday at 2,700.06. Both the stock market and the bond market are severely pressuring the Fed to lower guidance on rate hikes. If the Fed hikes in December and keeps the same dot plot, there will be a huge correction which could put the market in bear territory.